The door to these stairs is right behind the kitchen table. They lead to the FINISHED basement. 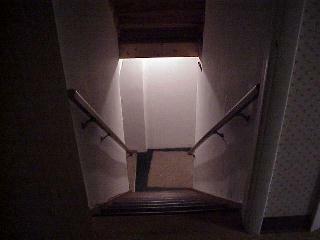 Turn to the left at the bottom of the stairs and you have the fun room of the basement. 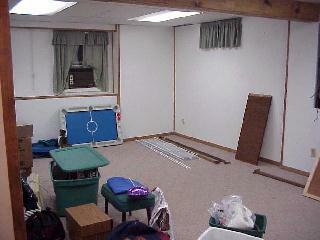 A look into the room. There are many ways to arrange this. I'm taking suggestions, but I think the pool table will be perfect in the middle of the room, the wet bar in the back left corner, and the big screen TV in the back right corner. 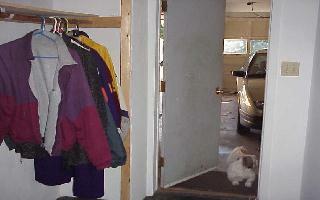 Turn to the right at the bottom of the stairs and you face the room with the furnace & hot water heater. 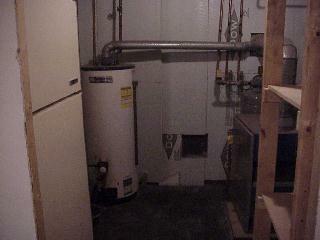 The hot water heater is about 15 years old and will probably need to be replaced soon. You can barely see it, but the previous owners left their old fridge. Melissa's parents donated their fridge to us, so we moved this to the basement. Perfect for stocking up if we're stranded in the house. 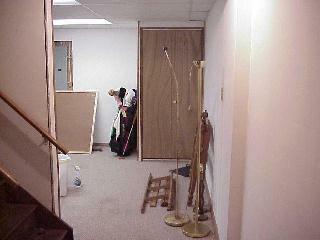 Turn right from the boiler room and you go into the work area of the basement. This is a nice workbench for the Bob Vila in us. 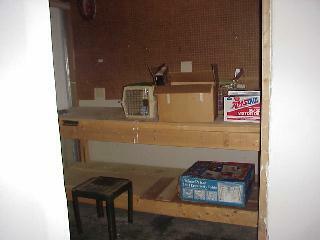 In front of the workbench is more shelving and a window to the outside. Two rights and a left from the bottom of the stairs will get you here, to the garage. A nice coat rack on the left for the winter apparel.